Are you looking for the best exercise bike reviews UK residents can lay their eyes on? We have them all here! In this article we will be featuring the best-selling and most popular exercise bikes in the spin bike and upright exercise bike categories. All the models featured come highly recommended and have excellent customer feedback on Amazon. In a few words we will mention the best features of each bike, for more in-depth information you can read the full review by clicking the link. First let’s take a look at the best spinning bike reviews. 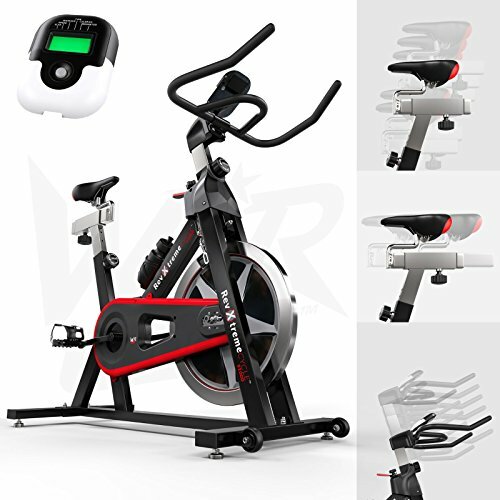 If it’s an affordable exercise bike that you are after then you can’t go wrong with this one by WE R Sports. Been a budget exercise bike it is fairly simple in terms of features. 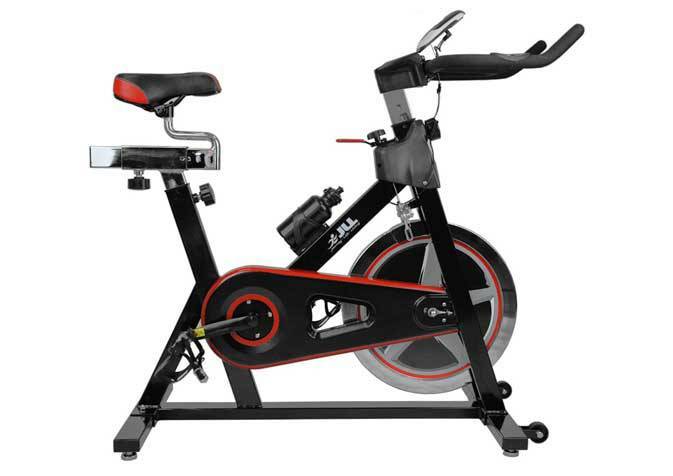 However, for the price it would be hard to find another exercise bike of this quality except for the XS Sports Training Cycle and the JLL IC300. Featuring a 13Kg flywheel, adjustable seat and handlebars and a five function monitor you can’t really expect more in this price bracket. Solid and robust in design with excellent reviews on Amazon this is a very good beginner spin bike for the money. 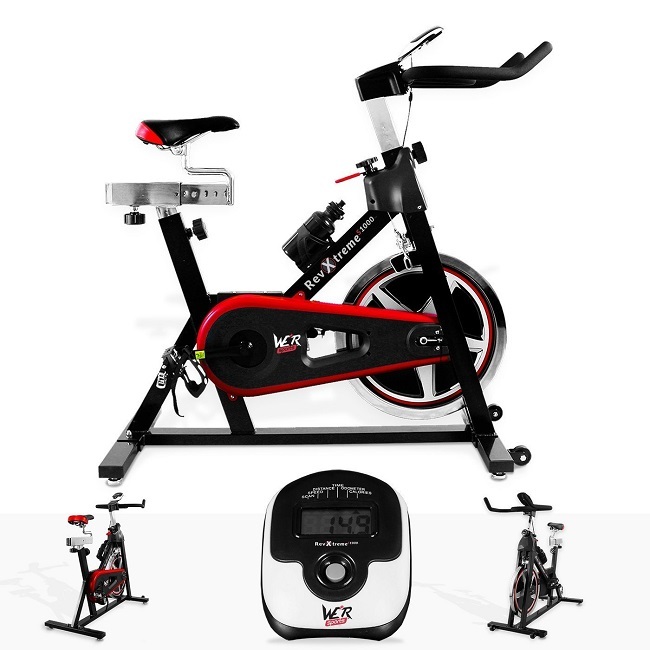 Similar to the previous model the XS Sports Indoor Training Cycle is among the very best budget exercise bikes UK residents can buy. When compared to the We R Sports exercise bike the customer does get a little bit extra for their money. First of all there is a 15Kg flywheel which is enough to provide a good workout. The seat and handlebars are again both adjustable making it easy to find a comfortable riding position. In addition there are also racing style handlebars, so the user can reach a true racing position when exercising. 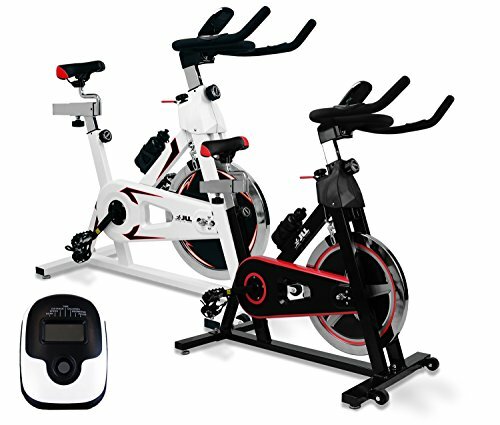 The JLL IC300 is a very popular spin bike. 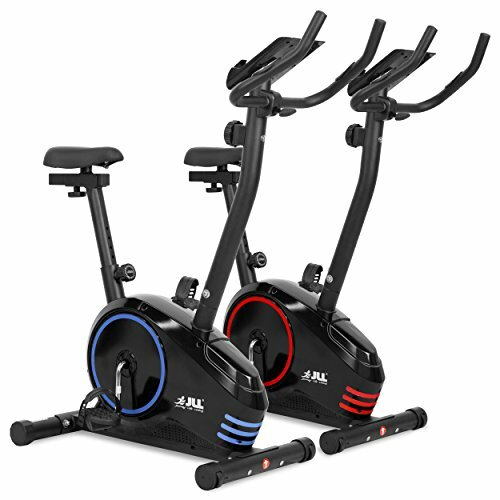 The JLL brand make some of the best budget and mid-range indoor exercise bikes available and customer feedback on the IC300 is very good. Featuring an 18Kg flywheel and 6 monitor functions and both adjustable seat and handlebars all the basics for a good spin bike are there. Furthermore this is a sturdy exercise bike and due to the weight there is no juddering like with some models. 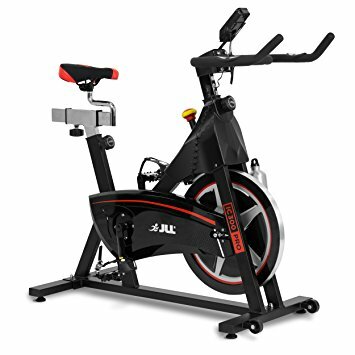 With excellent reviews on Amazon and very affordable in price the JLL IC300 is a very good introductory spin bike. The JTX Cyclo 6 is without doubt the best spin bike UK customer can buy. This bike features heavily in many review websites and comes with excellent customer feedback and for good reasons. The JTX Cyclo 6 has an overall weight of 64Kg and is as sturdy and reliable as they come. With a hefty 22Kg belt driven flywheel a smooth but tough workout is assured. This exercise bike has all the monitor functions needed for tracking fitness goals and includes a free heart rate chest strap monitor. Other features include an emergency stop button and water bottle holder. Check the full review for a full rundown on what’s probably the best stationary bike for home use. The JLL IC300 Pro is the third spin bike in the JLL series. This is their mid-range model and comes highly recommended for both beginners and more advanced users. With four and a half stars on Amazon this is a very popular indoor spin bike. Featuring a 20Kg flywheel and a monitor with six functions which are time, speed, distance, calories, pulse and RPM the JLL IC300 Pro is a well-rounded spin bike. Other features include a fully adjustable seat and handlebars as well as a three-piece crank. Sturdy and built to last this is one of the best spin bikes UK residents can buy for home use. As with spin bikes there are literally hundreds of different upright exercise bikes available to buy. As always some aare good and others, not so good. To save you time and money we have brought you all of the very best upright bikes based on quality, sales and customer feedback. As with spin bikes JLL also make some very good and affordable upright bikes. The JF100 is the best-selling budget stationary exercise bike in the UK. For a cheap exercise bike there are hardly any bad customer reviews and it comes with four and a half stars on Amazon. 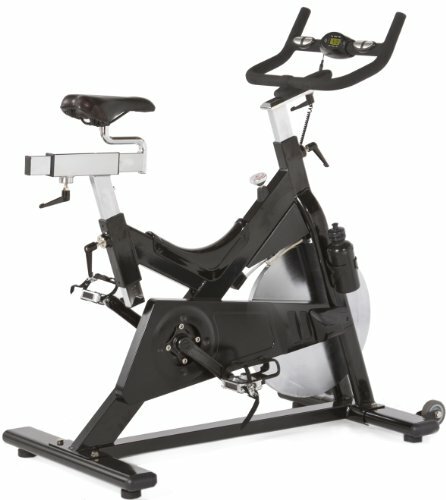 This stationary bike has 10 levels of magnetic resistance for a workout of varied intensity. The LCD screen shows time, speed, distance, calories, odometer and pulse. The handlebars are fully rotateable 360 degrees and the seat is fully adjustable. Featuring a pulse sensor in the handrails this is a great introductory exercise bike and is also great value for money. 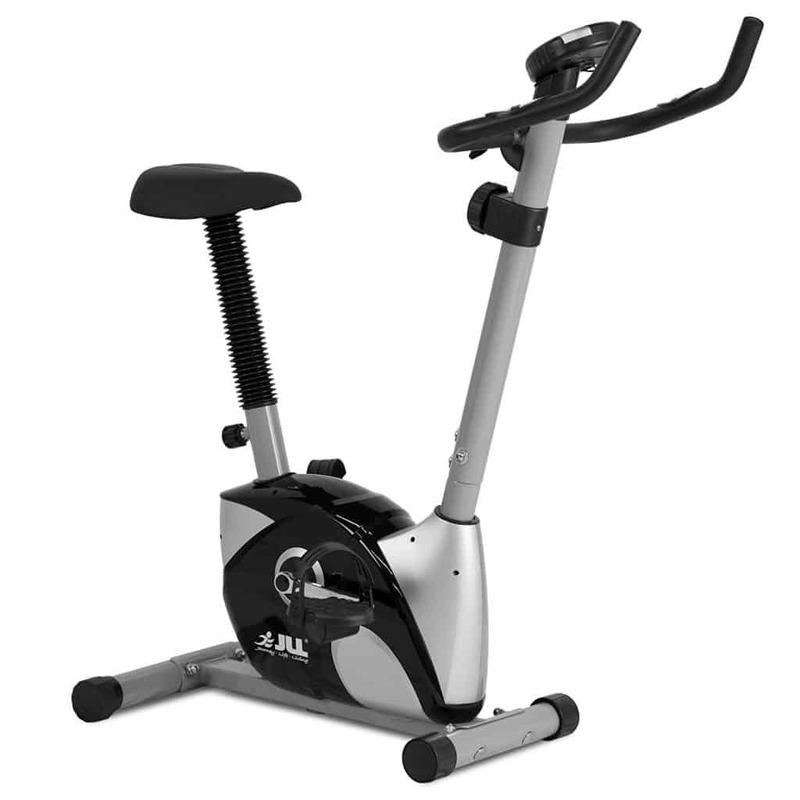 Another upright bike by JLL and this one is even better than the previous model. This bike also has a four an a half star rating which is always a good indicator of quality. First of all this bike has 8 levels of magnetic resistance and at the top end a solid workout is to be had from the JF150. The LCD features the usual time, speed, distance, calories, pulse and RPM. The handlebars rotate 360 degrees and the seat is adjustable to seven levels. This stationary exercise bike also has both forwards and backwards pedaling. Finally there is a tablet holder which is a nice touch. 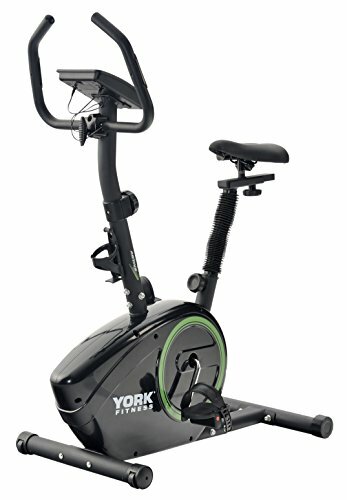 This bike by the ever popular York Fitness comes recommended by Amazon themselves as one of the best upright exercise bikes to buy. In terms of quality this bike is a step up from the previous two in our upright exercise bike reviews. This upright bike comes with eight levels of resistance. 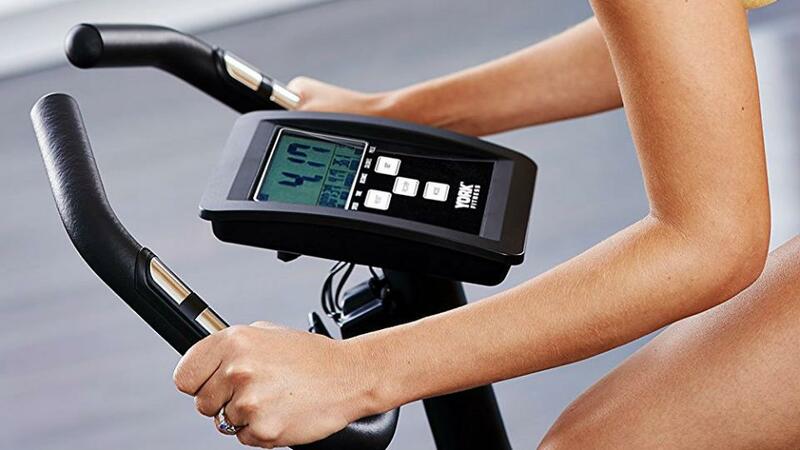 The large clear LCD display provides key workout information including speed, time, distance, calories burned and pulse rate, which is monitored via the sensors mounted on the handlebars. In addition to monitor functions there are four pre-set programmes included and a fitness test. To sum up, this is without doubt one of the best upright bikes on a budget available and comes highly recommended. In terms of features and overall quality the DKN AM-E exercise bike is better than any of the previous models featured in our best exercise bike reviews so far. 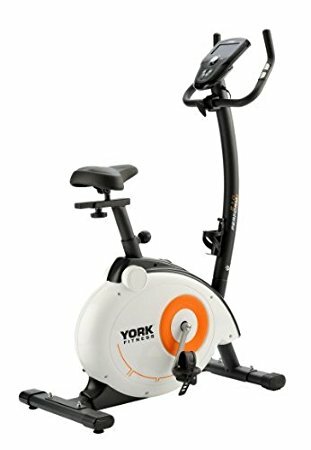 This upright stationary exercise bike is also recommended by Amazon as their “Amazon’s Choice”. 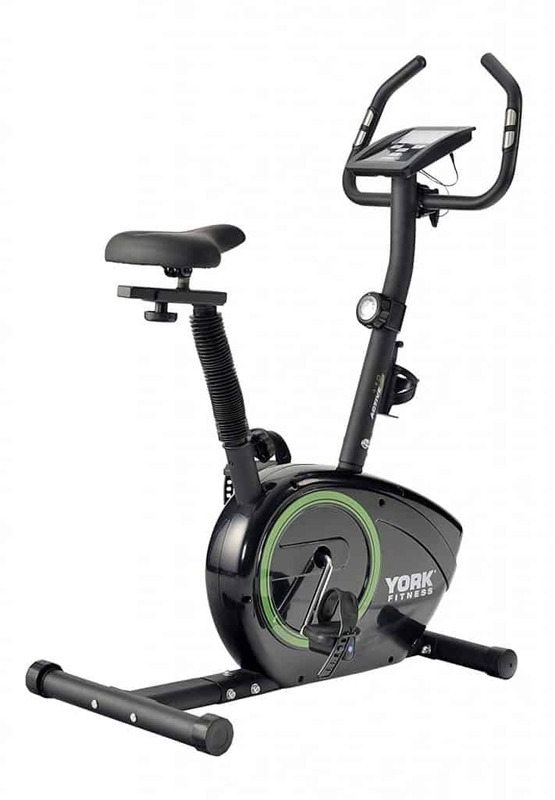 Another upright bike by York Fitness and also one of the best upright exercise bikes UK customers can buy. 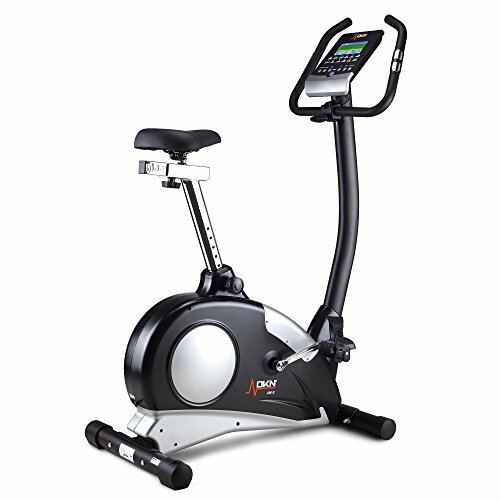 If you are looking for a very good quality exercise bike that gives the user a good workout this may be the one. This bike comes with a 7Kg flywheel and 32 levels of magnetic resistance. There are 19 programmes with the York Perform 210, so plenty to play with. The hill climbs and wattage settings are a particular favourite of many buyer’s as both provide an intense workout. 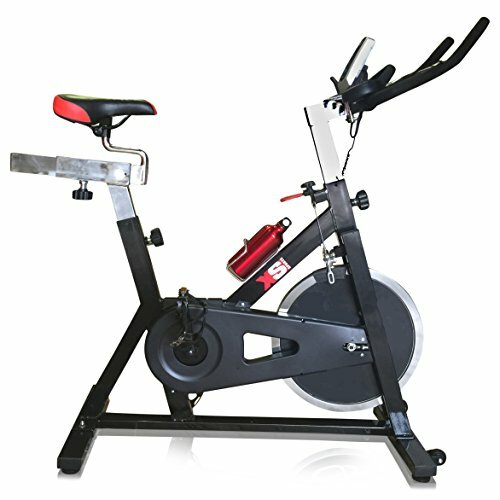 The seat on this upright bike is fully adjustable and the pedals are self leveling for ease of use. All in all this is among the best upright exercise bikes in its price range. All of the exercise bikes featured in our best exercise bike reviews UK guide are among the top-selling models. In addition every model comes with very good customer feedback on Amazon. This is always a very good indicator of how good a product is and with our expert opinion chucked in the mix, you can’t go wrong with any of the items featured. What Are The Best Budget Rowing Machines?